Is there a procedure out there for getting an RX8 to start after a prolonged spell of non-use? I attempted to start her after returning from my holidays (about 10 days of not used) without success. Normally she starts after a couple of cranks but all that's happened this time is the starters spinning the engine but showing no signs of firing. The battery is almost flat so I'll retry on a jump start, but is there any helpful hints out there for future reference. Note, I always follow this start up procedure, turn ignition on to the 2nd position and get myself settled until dashboard lights go out then start with clutch depressed and no accelerator pedal. I'm thinking after a long break is it helpful to perhaps pump the accelerator a couple of times to get fuel moving or is this more likely to cause flooding? I'm not sure whether to attempt the restart on the assumption it is now flooded or not! Re: Starting RX8 after holidays. Started mine recently after 5 months. It started first turn, after about half a second. The only "trick" necessary is to make sure the battery is fully charged before trying. I've never had a problem. Scartlead touches on the useful de-flood feature above. 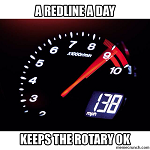 Make it a habit that if you have left the car long enough to wonder if the battery is flat, begin cranking with the accelerator fully depressed to prevent fuel injection. If it turns over as normal simply release the accelerator whilst cranking and it will start. However as Pete mentioned already, if the battery is kept charged then just fire it up - no special procedure required. Thanks for all the advice as ever. Got her running again just as 2 young lads were walking past and commenting on the nice car! This time it wasn't interested in a jump off my son's car so I put the battery on charge overnight, (and all Day). Fitted said battery and starter turning slow as... Hooked it up to my V60 for a jump and straight away she fired up. Took it for a 10 mile blast and now the starters whirring away fine. It seems that maybe the battery is not holding its charge over time. Battery was new when I bought the car 18 months ago and its a Halfords job. Might drop in there and get it checked by them and argue the case! I'm going to contact the previous owner and see if he still has the receipt as well. If the battery tests fine I will start directly off jump leads if it's left for a prolonged time, I reckon under the circumstances that's the best solution, it'll only be after holiday's, etc so not so much an issue.